Bonnie Tyler's innovative egg-peeler makes perfect deviled eggs and shell-free egg salad a reality. Visualize a future without crunchy shells in your egg salad. Experience the euphoria of perfect deviled egg whites. Bonnie Tyler's Easy Egg Peeler is egg-spressly designed to make hard-boiled dreams come true. Boil egg(s) and cool in an icy water bath. Put a quarter cup of cold water in the peeler, then an egg. Snap the cap into place, and shake a few times. The sturdy plastic body is clear so you can watch the progress; when you see the cooked white appear, you're done. Pinch the egg, and its shell will peel off like a jacket. The patent-pending design, including the bumps on the inside, help release the membrane and shell from the egg. Especially handy in the morning, before the caffeine hits. Makes an egg-shellent college or new apartment gift. Made in Connecticut. Connecticuter Bonnie Tyler is neither an engineer nor a designer, just a friend who offered to bring deviled eggs to a party and, after a failed attempt at peeling, showed up with a bag of potato chips instead. Determined to find a solution to this dreaded kitchen chore, she turned to the Internet to find a product that solved her problem. Finding nothing but videos of giant industrial machines peeling thousands of eggs at a time, Bonnie combined the elements of industrial peeling (i.e., vibration, movement, and water) to create something small, portable, and easy to use at home. That’s how her egg-peeling solution was hatched. She even managed to get it manufactured in Connecticut, her own backyard. That’s something to crow about! 4" H x 3.25" Dia. Best and most useful gift I bought this Christmas. Easy to clean, so simple its hard to believe it works so well. I don't know how, but it truly works! I bought this as a stocking stuffer for my mom, thinking it would be cool if it worked but was pretty skeptical, because we've never had an easy solution to peeling hard boiled eggs! It truly does work - though I don't know how - with no mess and no fuss! I will be buying more of these as gifts and for myself! I hate have to peel off the egg shells in the morning and this makes it much more great and easier! Egg needs to be over done and cooled for five minutes. So if you like your egg warm it is useless. Egg peeling was a nightmare. Not now! I love this! It's well made. It doesn't take up a lot of space. But best of all it works! Peeling hard-boiled eggs is a chore I do not relish. Though I use hard-boiled eggs constantly, the peeling part was always a bummer. This device, not only did not work, it left my egg badly damaged to the point that it was only good for egg salad. Now I get the chance to test their customer service when I return it. Okay, the video promoting it is a little over the top cheesy...but it really is pretty amazing. I LOVE it! 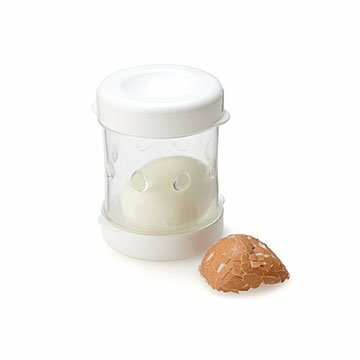 This is a great gadget and it does what it claims to do....take the work out of peeling eggs!! No more chunks of white coming off with the shell...the little jar makes peeling eggs an easy chore! Don't shake this too hard, or your egg will be purÃ©ed! Once you get the hang of it, it is so helpful! !